At Cactus Language we believe that the best way to learn a language is to speak and practise with real people in a classroom environment (our 5 week courses in London and Brighton start February 21st). However, as language learners ourselves, we also know that there are some fantastic online language learning resources and apps that can help you on your language learning journey. We would like to share with your our favourite online practise tool and hope that it helps improve your language skills. I can use the app during my commute it’s a fun way to pass the time and also reinforces the vocabulary and grammar I learn in class. And it’s completely free! 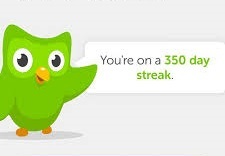 Duolingo is a good tool to complement a language course on a daily basis. You can use it anywhere, and it’s a great way to regularly practice what you’ve learned. I can see how many days I practise and this keeps me motivated I can also add friends and see how they are doing. Each lesson includes a good variety of activities with some focus on listening, translation, grammar and vocab which keeps things interesting. I like using Duolingo because it’s a quick and easy way to keep up my language skills on a daily basis. The app identifies the areas I struggle with, and then provides more opportunities for me to check and practise those areas which means I know that I am improving. How can Duolingo be free? Duolingo was created help translate the entire internet into multiple languages. This means that every time you use the app, which you do so for free, you are contributing towards the internet being translated into many different languages. What Languages does Duolingo Offer? Duolingo provides an excellent way to practise the language you are learning a little bit every day. The activities will reinforce some of the language – both grammar and vocabulary that you learn in your classes, and will keep you motivated. You can use the app whenever you have a free 5 or 10 minutes which makes it super convenient. Duolingo offers language practise for 14 of the 24 languages we teach.